A wristwatch is not for everybody and only few people are part of Club 24! Accordingly to two separate consumer studies, about only 79% and 86% of the population respectively in U.S. and U.K. own wristwatches (percentages further drop among young people). As per the U.S. study, 76% of the wristwatch owners claim to have an analog watch and most of the time it is based on the 12-hour system. The 12 hour system is what we are all used to; hours are counted from 1 to 12 twice a day and in analog watches a hand indicating the hours makes two complete rotations every day. We grow up with the 12 hour system and get used to it over time. We are so used to it that we can read a watch even without any numbering or marking system on it. However, the 12 hour system is neither the most intuitive nor the first system that has been introduced to measure the passage of time. Other systems exist and one of the most common (after the 12-hour one) is based on a 24-hour cycle, and it is used in the so called 24 hour watches. In those watches the hand which indicates the hours makes a complete rotation in 24 hours – yes, only one rotation per day. Those watches are used by few people, but there is a clear trend with more and more companies developing 24 hour watches. The question is: who is part of “Club 24” (24 hour watch enthusiasts)? Can anyone benefit from those watches and join Club 24? We believe that a 24-hour watch is more intuitive and also that it can bring lots of benefits once people get used to the new system. In the next sections, we discuss the seven groups of people that would specifically benefit from a 24 hour watch, though we believe that the adoption of a 24 hour watch could be beneficial to a much broader audience. Club 24 is made of seven groups of people who can potentially benefit the most from using 24 hour watches: pilots and astronauts, explorers, submariner personnel and people with similar work shift, planners and entrepreneurs, ‘alternative’ people, soldiers and people who do ‘precision’ work and radio operators or UTC users in general. Long distance airplane pilots and astronauts travel across multiple time zones and a 12-hour watch might bring some confusion on whether the time refers to day or night hours. Similarly, people who don’t have access to natural light like miners/underground workers or people that are located in the Polar Regions might have the same challenge. The cosmonaut Sergei Krikalev, for instance, used (and contributed to the development of) the Raketa Baikonur, and the cosmonaut Vladimir Dzhanibekov used the Cosmonavigator, both 24 hour watches. In those situations, in factm a 24-hour watch can prevent time confusion. Some of the 24-hour wristwatches have a crystal clear separation between day and night. For example the Botta Design Uno 24 (Botta watches) as well the Airnautic by Ocean 7 both have a clear color separation between day and night with the top part of the dial in a clear color (6:00 to 18:00) to represent the day and the bottom part of the dial in a darker color (18:00 to 6:00) to represent night time. The Frederique Constant Manufacture Tourbillon (or Slimline Tourbillon) is not a 24-hour watch but it still helps avoiding the above confusion. This watch is a bit anomalous as it showcases a normal 12-hour cycle but it has also a subdial with a double ended hand (sun and moon icons at the two ends) that clearly indicates whether the time refers to the 12 day hours or the 12 night hours. An explorer is a person who investigates unknown regions, travels in or through an unfamiliar country or area in order to learn about it. Often explorers get in places where it is not easy to find orientation (e.g. deserts) and/or distinguish the difference between day and night (e.g. speleologists). For those people a 24-hour watch might help not only via the above described benefit of differentiating day and night but also because those watches are an immediate compass. In fact, via pointing the hour hand toward the sun one can find the North position where the 24-hours mark is (midnight mark). This is valid for any 24-hour watch and there is no easier way to combine a compass with a watch. For years, sailors serving aboard submarines worked a different work day than the rest of the world. Aboard United States submarines personnel used to have 18 hour work cycles: six hours work, six hour maintenance and entertainment and six hours sleeping. In other words, their day was made of 18 hours and the logic was that it was easier for sailors to give their undivided attention to the electronic equipment if the work shift was only six hours. Luckily, since December 2014 the Navy started the transition to a 24-hour day in three shifts of eight hours each in order to reflect the human being need to respect a circadian rhythm. Not everyone on board, however, has the same 24-hour shift so a careful schedule planning is needed and a 24-hour watch is almost instrumental for a correct implementation of the new schedule. Actually the ideal watch for the personnel would be a 24-hour watch in which it is possible to divide the dial into three parts of eight hours and those parts can move depending on the schedule. All the best planners have one thing in common: they strive to achieve the best balance between “helicopter view” and the capacity to understand and navigate into details. Both skills are instrumental for the best planners as well as for the most successful entrepreneurs. A helicopter view is needed also in terms of time frame and what could help better than a 24-hour watch for this purpose? Seeing the entire day at a glance in a wrist watch is paramount for perfectly managing the daily schedule! The 24-hour watch gives a totally new perspective and helps understand how time is currently used and how it should actually be used – for more details on this please refer to our time analyzer discussed in the article “#1 secret to live life to the fullest”. Notably entrepreneurs are master in time management as this is one of the most important and limited resource – no one talks about it but they are the ones who might benefit the most from a 24 hour watch! Interestingly to note that the 24-hour system is the one that has been used to standardize and harmonize time planning across different geographies driven by the expansion of the railroad – this is because this system was valued as the best for planning purpose. There are two groups of people that we would define “alternative”: i) people who want to have a different, “no rush” lifestyle and ii) people who just want to be different. Both groups believe that a 24 hour watch can help them. There are companies that claim that a 24-hour watch can change the way people live (e.g. slow-watches) and they target the first group of people. A U.S. study revealed that 30% of the population sees the watch as a fashion accessory or piece of jewelry. As such the wrist watch is another element of differentiation for the people that want to stand out from the crowd. There are myriads of different kind of unusual and unique watches (see also our other article “the most unusual and unique watches”) that could address this objective and the 24-hour watches are among the most different. In fact, only few people are willing to change from a 12-hour system to a 24-hour system keeping those watches an exclusive. Some professions require an unmistakable time precision. This is, for example, the case of the army personnel, police officers, surgeons and doctors and more. None of those people can make mistakes in the definition of time because the consequences might be dramatic. Confusing an 11am for 11pm in a police case, in a military attack or surgery operation is a very serious thing. Hence those professionals should use 24-hour watches in order to prevent such possible mistakes. Considering the peculiarity of their job the structure of the 24 hour watch will also most likely need to be super solid and robust (consider the army people) and water resistant (think about what can happen to a doctor or surgeon watch). 7. Radio Operators / UTC users in general. UTC stands for Coordinated Universal Time and is the primary time standard by which the world regulates clocks and time. In general UTC is the time standard used in aviation (e.g. for flight plans and air traffic control clearances), weather forecasts and maps to avoid confusion about time zones and daylight saving time. The International Space Station also uses UTC as a time standard. But there is also another group of people that we did not mention before. This group is made of the amateur radio operators who often schedule their radio contacts in UTC. In fact, as the transmissions on some frequencies can be picked up by many different time zones, they generally make reference to UTC and could benefit from a 24-hour watch. 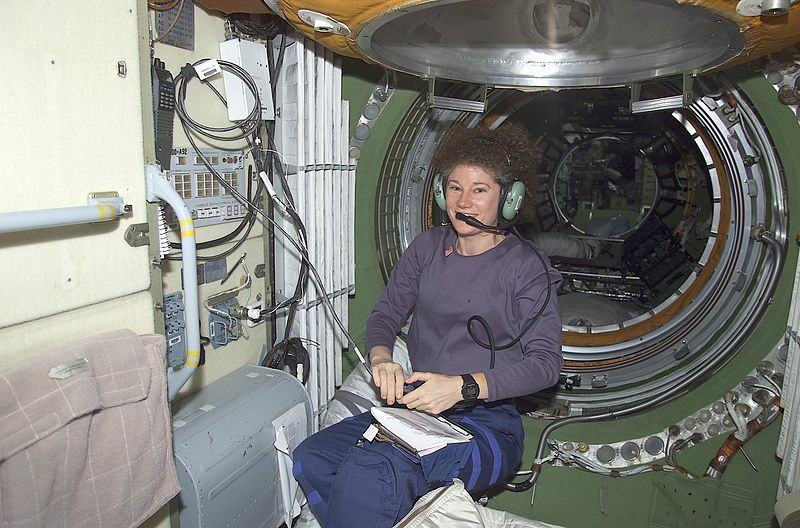 In this picture, you might see the cosmonaut Susan J. Helms talking from the ISS to amateur radio operators on Earth, and wearing a digital 24 hour watch (G-Shock DW5600C). ...not even for the above categories of people. Of the people belonging to the above seven groups, however, only a very small percentage use 24-hour watches. The key challenge for a broader use, as mentioned before, resides in the adoption of the 24-hour system by people that are used to a 12-hour system since they were kids. To help with the transition some watch makers, including Todd & Marlon, offer watches with a double-XII system. Watches with double-XII system are nothing more that watches with a 24-hour dial divided into two 12-hour sections (i.e. numbers go from 1 to 12 twice in the dial). Those watches are easier to use because the way to read them is in between the two systems. People can still refer to 1-12 am or 1-12 pm but the watch clearly differentiate day and night. The double-XII wrist watches are even more difficult to find as to our knowledge only four companies (including Todd & Marlon) manufacture or manufactured them. Angular Momentum of Switzerland manufacture only on demand La Boulle Classic Day & Night timepiece which is a 24-hour watch based on a double-XII system. The other watch manufacture is Bulova which use to have a military watch based on the double-XII system (Bulova WWII) but we believe it is not anymore in commerce. The third company was Twenty First Century Watch Corporation but we have not been able to find any of their watches for sale on internet (their website seems not to work). In other words Todd & Marlon watches (#YOURTIME collection) will be the only 24-hour wristwatches based on the double-XII system regularly in commerce. #YOURTIME watches offer all the benefits of a 24-hour watch and at the same time they still have a close reference to the way people talk about timing. Most people still refer to time on a 12 hour scale making reference to a.m. vs p.m. or morning vs evening. Only in few places (e.g. Nordic region in Europe) or few people refer, for example, to 19:00 when talking – the major part of people would rather say 7pm or 7 in the evening. In other words #YOURTIME watches “talk” the language of most people while offer them the benefit of a 24-hour watch. Another advantage of #YOURTIME watches is the fact that every single hour number is clearly marked while many of the 24-hour watches alternate a number with a sign mark. This dramatically simplifies the reading. In conclusion if you are part of any of the above seven groups of people you might seriously consider buying and using a 24-hour watch – in that context a wristwatch based on the double-XII system might help with the transition. Be warned though! Once you get hooked on the 24-hour dial, you will never want to wear a 12-hour watch again. Conversely, if you don’t belong to any of the seven groups, you might still want to give a try to a 24-hour watch as it will give you a different, more interesting and intuitive look at life and the way you spend your time. You can find more information about 24-hour watches in our other article: 24 Hour Clock Benefits, and if you want to see most of the existing 24-hour watches you can refer to the great board on Pinterest prepared by BlackBecky in UK – 24 hour watches. We also want to thank the redditors who helped us with the article.